The Outdoor Gallery of the City of Gdansk is an art project for the Lower Town – the district of Gdansk where Laznia Centre for Contemporary Art is situated. This culture institution through the cooperation in the framework of a long-term revitalization plan supports the process of social and architectonic transformation of the neglected district. The project consists of two important elements: international competition aiming to create a permanent collection of works of art in urban space and a wide range of educational activities. 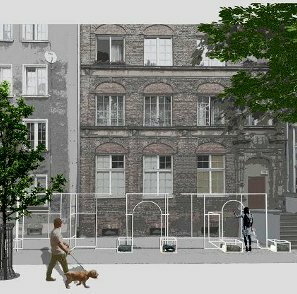 Gdańsk-based project group Tabanda has won a nationwide competition for a public object organized by the City of Gdańsk and ŁAŹNIA Centre for Contemporary Art. The competition to rearrange the plot on the corner of Świętego Ducha and Przędzalnicza Streets was announced in August. Two teams, Tabanda (Gdańsk) and BudCud (Krakow) and two individual designers, Paweł Grobelny (Poznań) and Michał Gdak (Kielce) were invited to participate. an artistic installation (temporary or permanent) or designer street furniture that would be attractive for locals and tourists alike. To this end, the Mayor’s Bureau for Culture has approached Łaźnia CCA to hold a competition for a work of art dedicated to this location. Serdecznie zapraszamy w dniach 6-8 lipca 2018 do udziału w warsztatach malarskich. Wspólnie będziemy malować i składać barwne domki dla ptaków będące częścią projektu “Zapach koloru” Carmen Einfinger. Razem stworzymy dzieło sztuki, które już wkrótce zamieni skwer przy ul. Dolnej w rajski ogród! Centre for Contemporary Art Laznia is located in a district which requires financial support as well as a complex educational input. The social issues made it necessary to reach for means and methods that could appeal to the local society. Education was integrated with the mechanisms of revitalisation. The workshops realised within the framework of The Outdoor Gallery of the City of Gdansk are conducted by renowned artists representing theatre, dance, music, visual arts, media, hand-crafts as well as by educators practicing alternative educational methods.